Program Terms, Conditions, and Eligibility Criteria: 1. 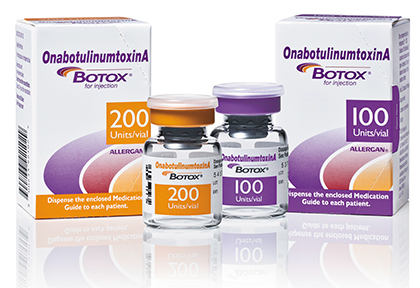 This offer is good for use only with a valid prescription for BOTOX® (onabotulinumtoxinA). 2. Based on insurance coverage, Chronic Migraine patients can receive up to $700 off per treatment for up to 5 treatments in 2018. The offer is valid for up to $1000 off per treatment for up to 4 treatments received in 2018, for people with Spasticity. The offer is valid for up to $600 off per treatment for up to 4 treatments received in 2018, for people with Cervical Dystonia. The offer is valid for up to $500 off per treatment for up to 4 treatments received in 2018, for people with Overactive Bladder or Overactive Bladder due to a neurologic disease. The offer is valid for up to $150 off per treatment for up to 4 treatments received in 2018, for people with Blepharospasm. The offer is valid for up to $150 off per treatment for up to 4 treatments received in 2018, for people with Strabismus. The offer is valid for up to $100 off per treatment for up to 4 treatments in 2018 for people with severe underarm sweating. All treatments must be received during 2018. Maximum savings limit of $3500 per year for people with Chronic Migraine, $4000 per year for people with Focal Spasticity, $2400 per year for people with Cervical Dystonia, $600 per year for people with Blepharospasm, $600 per year for people with Strabismus, $2000 per year for people with Overactive Bladder or Overactive Bladder due to a neurologic disease, and $400 per year for people with severe underarm sweating applies; patient out-of-pocket expense may vary. 3. This offer is not valid for use by patients enrolled in Medicare, Medicaid, or other federal or state programs (including any state pharmaceutical assistance programs), or private indemnity or HMO insurance plans that reimburse you for the entire cost of your prescription drugs. Patients may not use this offer if they are Medicare-eligible and enrolled in an employer-sponsored health plan or prescription drug benefit program for retirees. This offer is not valid for cash-paying patients. 4. This offer is valid for up to 4 or 5 treatments per year, depending on the condition. Offer applies only to treatment received before the program expires on 12/31/18. 5. Offer is valid only for BOTOX® and BOTOX® treatment-related costs not covered by insurance. 6. A BOTOX® Savings Program check will be provided upon approval of a claim. The claim must be submitted with treatment details from an Explanation of Benefits (EOB) or a Specialty Pharmacy Provider (SPP) receipt. 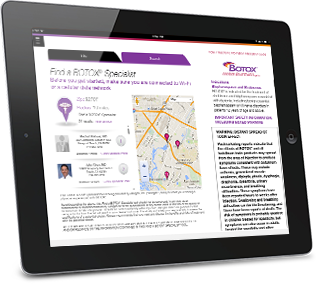 (If the BOTOX® prescription was filled by a Specialty Pharmacy Provider, both EOB and SPP details must be provided.) All claims must be submitted within 90 days of the date of EOB receipt. You may be required to provide a copy of your EOB or SPP receipt for your claim to be approved. 7. A BOTOX® Savings Program check may be sent either directly to you or to your selected healthcare provider who provided treatment. For payment to be made directly to your healthcare provider, you must authorize an assignment of benefit during each claim submission. You are not obligated to assign your BOTOX® Savings Program benefit to your healthcare provider to participate in the program. 8. Allergan reserves the right to rescind, revoke, or amend this offer without notice. 9. Offer good only in the USA, including Puerto Rico, at participating retail locations. 10. Void where prohibited by law, taxed, or restricted. 11. This offer is not health insurance. 12. By participating in the BOTOX® Savings Program, you acknowledge that you are an eligible patient and that you understand and agree to comply with the terms and conditions of this offer.